As you age, your body's protein, carb, and fat needs change, making it harder to hold on to muscle. Here's how to build a diet to sustain you for a lifetime! From teens to people in their 80s, improving one's physique is a truly "ageless" pastime. Sure, not all of these people call themselves bodybuilders, but more of them in all age groups are eating and training with the pursuit of more muscle in mind. And with good reason! The further on we get in age, the more pronounced the benefits of a little more muscle mass become in terms of quality of life and longevity. In short, you're never too old to see the benefits of getting stronger. But while training plays a major part in giving your body the stimulus to change, there's plenty you can do with your diet, as well. In fact, structuring your diet around your age and goals is essential to great results. Of course, I'm not going to hit you over the head with some "one magic food" baloney here. Just the opposite. I'm going to help you utilize the classic way bodybuilders balance the three macronutrients—protein, carbohydrates, and dietary fats—to ramp up muscle growth and fat loss. The only difference: You're going to optimize them for your age! It turns out there's been an extensive amount of research into how people at different ages respond to different levels of the macronutrients, and it's not hard to make some recommendations that could pay off big-time for you. Let's chow down! 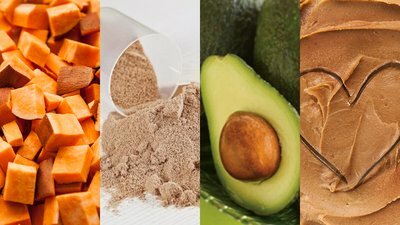 You are probably aware that dietary protein is important for stimulating muscle growth (through muscle protein synthesis, or MPS) and optimal recovery from training. But how does age affect this anabolic (muscle-building) response to protein? As you age, a diet rich in protein can help prevent age-related decline in muscle protein synthesis. Why is this? It appears the decreased response may be explained by a decrease in the activity of the protein mTOR and the enzyme p70S6K, both of which are involved in initiating protein synthesis. [2,4] Furthermore, it appears that the decreased anabolic response in the elderly may be due, at least in part, to the natural increase in oxidative stress that accompanies aging. Oxidative stress is the type of damage that all those antioxidants are meant to mitigate. As levels of certain molecules known as "reactive oxygen species" go up, levels of protein synthesis go down. There is hope, however. Consuming a diet rich in protein—specifically, the amino acid leucine—can help prevent the age-related decline in muscle protein synthesis. Even if you don't measure out your protein to the gram, the lesson here is that as you age, you need more protein. If you can have it with antioxidant-rich foods, all the better. You can't go wrong with a diet rich in meat, vegetables, fruits, nuts, and seeds here. Like protein, adequate intake of carbohydrates can positively affect muscle protein synthesis rates. However, compared to their younger counterparts, older adults may need fewer carbs to experience muscle growth. The primary way carbohydrates influence muscle growth is by increasing insulin secretion. Insulin helps shuttle available amino acids to cells to jump-start the muscle growth and repair process. In this sense, a fair amount of carbohydrates are still needed even in your later decades of life to help maintain and grow muscle. Carbohydrates consumed together with protein appear to have a greater anabolic effect in adults than simply consuming protein alone. It also appears that insulin can still guard against protein breakdown in adults, meaning it could have a "muscle-sparing" effect. Additionally, there is some evidence that eating carbs can prolong the body's muscle-building response to amino acids. Compared to their younger counterparts, older adults may need fewer carbs to experience muscle growth. In short, you can still benefit from carbs as you get older. But because physical activity and metabolic rate tend to decline as you age, you probably don't need nearly as many of them. As your protein intake goes up with age, your carbohydrate intake can comparatively go down. It's worth repeating here that these recommendations are for maximizing muscle gain, so they will need to be adjusted for individuals wanting to lose body fat. Additionally, as I mentioned in my PH3 Power and Hypertrophy Trainer, individuals vary wildly in their ability to "tolerate" carbs—that is, eat them without turning them into body fat. So consider these numbers simply to be a start to the conversation. While I think the protein numbers are more or less solid, these carb recommendations definitely aren't set in stone. The classic way for bodybuilders to construct their diet plan is like this: Protein first, and then tinker with the balance between carbs and fats until you find the sweet spot that works for you. Often, the protein stays consistent, regardless of whether the goal is muscle gain or fat loss. This approach works wonders because it prioritizes the nutrient most people neglect most—protein—and gives endless room for customization in the other two macronutrients. Appropriately, I advise that, as you age, your fat intake should largely be determined by your carb intake. Protein first, and then tinker with the balance between carbs and fats until you find the sweet spot that works for you. In other words, while someone who is younger and still sensitive to the anabolic effects of carbohydrates may be better off consuming lower fat (never lower than 0.2 grams per pound of body weight) with more carbohydrates, an older individual may want to consume fewer of their calories from carbohydrates, and more from protein and fat. As they age, far too many people in their middle years and older take what is effectively a haphazard approach to their diet. If they want to lose weight, they keep eating the same things in the same balance, but simply cut serving size. If they want to gain muscle, they eat their normal diet, plus a protein shake or bar every now and then. That can work to a limited degree for certain people, but it's far from ideal. You deserve better—and getting your macros in the right ballpark is the best place to start! Get just a little more systematic about what you're eating to go along with your training, and you can amaze yourself with what you're able to achieve at any age!